Qualification Day (Qual Day) is the last day of Firing Week during recruit training. During Firing Week, the second week of marksmanship training, recruits begin before sunrise, preparing their rifles and themselves to shoot the known-distance course of fire. During Firing Week, the second week of marksmanship training, recruits begin before sunrise, preparing their rifles and themselves to shoot the known-distance course of fire. Recruits prepare for rifle qualification day by firing rounds of both slow fire (one shot at a time) and rapid fire (10 shots in a row). 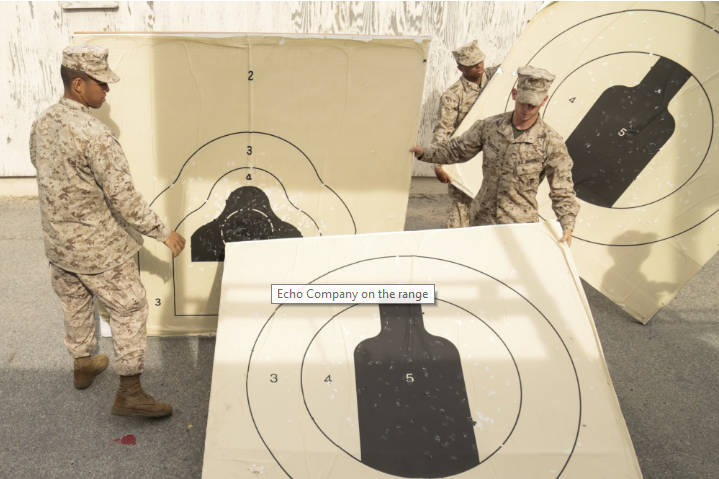 Recruits fire from four shooting positions at ranges of 200, 300, and 500 yards. Keep up the heart rate: Instead of recruits staying stationary while shooting, they are required to start at the standing position and quickly get into the kneeling or prone position when the targets have appeared. Engaging the enemy: Recruits begin qualifying at the 500 yard line then advance towards the 100 yard line. Maintaining situational awareness in combat: New targets show both friendly and enemy foes and recruits must maintain awareness of the targets to determine when to shoot forcing them to make combat decisions. These changes to the standards for rifle qualification focus more on teaching recruits how to engage enemies in a combat-related environment. On Qual Day all recruits are trying to shoot their best and are striving for the coveted "Crossed Rifles" of the Rifle Expert badge. Recruits can also earn the Rifle Sharpshooter and Rifle Marksman badges. The Marine Corps Times stated in January that the Marine Corps is in the process of esperimentation and evaluations for possible changes to the annual rifle qualification. This page will be updated with any changes that are made. U.S. Marine Corps recruits Kevin Santiago-Rosa and Tyler Guertin with Company E., 2nd Battalion, Recruit Training Battalion, change out targets in the pit at the range on Marine Corps Recruit Depot, Parris Island, S.C., March 8, 2017. Recruits provide pit service for recruits that are preparing for qualifying with the M16-A4 Service Rifle. — (U.S. Marine Corps photo by Lance Cpl. Sarah Stegall/Released). Qualifications badges are available for purchase at the EGA Shop, where 100% of the proceeds benefit Marines and their family members through the outreach programs of MarineParents.com, Inc. Click here to shop now.